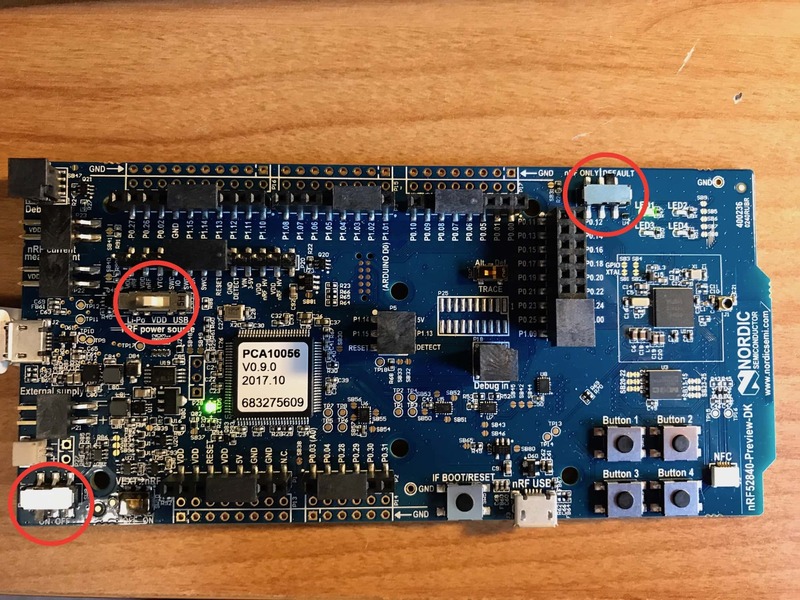 Today’s tutorial focuses on setting up the environment for nRF52 Mac development and debugging for Bluetooth Low Energy applications. 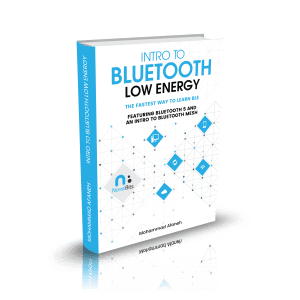 Specifically, I will be using the new Nordic nRF52840 Preview Development Kit board that supports the enhanced features of Bluetooth 5 (including longer range, bigger advertisements and increased speed). I ran through all these steps with Xcode already installed on my Mac, so I recommend installing it first to be able to run through the tutorial successfully. On macOS, unless you’re running within a Virtual Machine, you’re stuck with following tutorials that help you set up with Eclipse (or you can shell out some serious money for IAR or Keil). I’m a big fan of open-source tools such as GCC and believe they have some major advantages over proprietary and IDE-based tools (automation, consistency across multiple platforms…etc). Alright, enough with all this Eclipse vs. NetBeans dilemma. Let’s get technical. The new nRF52 chips support Bluetooth 5. Support for multiple development environments and toolchains including GCC, which gives developers more freedom and flexibility over what other vendors provide. The excellent support you get from Nordic’s Developer Zone. The nRF52 Series offers pin-compatible device options for Bluetooth® low energy, proprietary 2.4 GHz, and Apache®solutions giving you the freedom to develop your wireless system using the technology that suits your application the best. Our unique memory and hardware resource protection system allows you to develop applications on devices with embedded protocol stacks running on the same processor without any need to link in the stack or strenuous testing to avoid application and stack from interfering with each other. The nRF52 runs a proprietary BLE stack provided by Nordic Semiconductor called the SoftDevice. A SoftDevice is a wireless protocol stack library for building System on Chip (SoC) solutions. SoftDevices are precompiled into a binary image and functionally verified according to the wireless protocol specification, so that all you have to think about is creating the application. The unique hardware and software framework provide run-time memory protection, thread safety, and deterministic real-time behavior. The Application Programming Interface (API) is declared in header files for the C programming language. These characteristics make the interface similar to a hardware driver abstraction where device services are provided to the application, in this case, a complete wireless protocol. 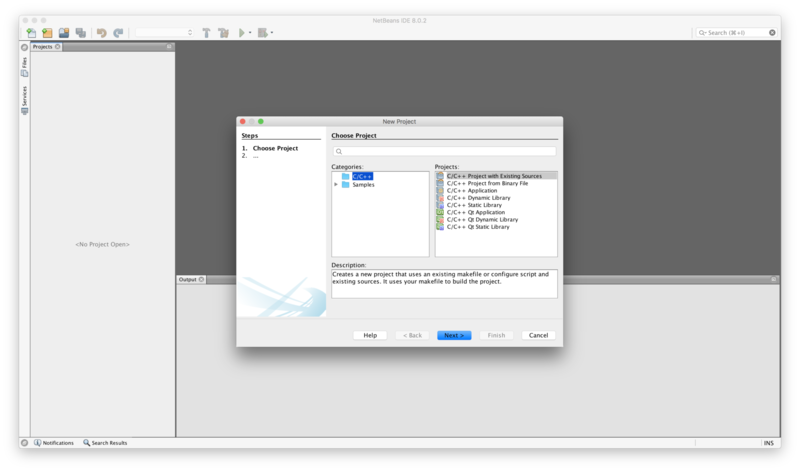 NetBeans is an open source IDE that’s targeted towards Java development but supports other development environments including C & C++. 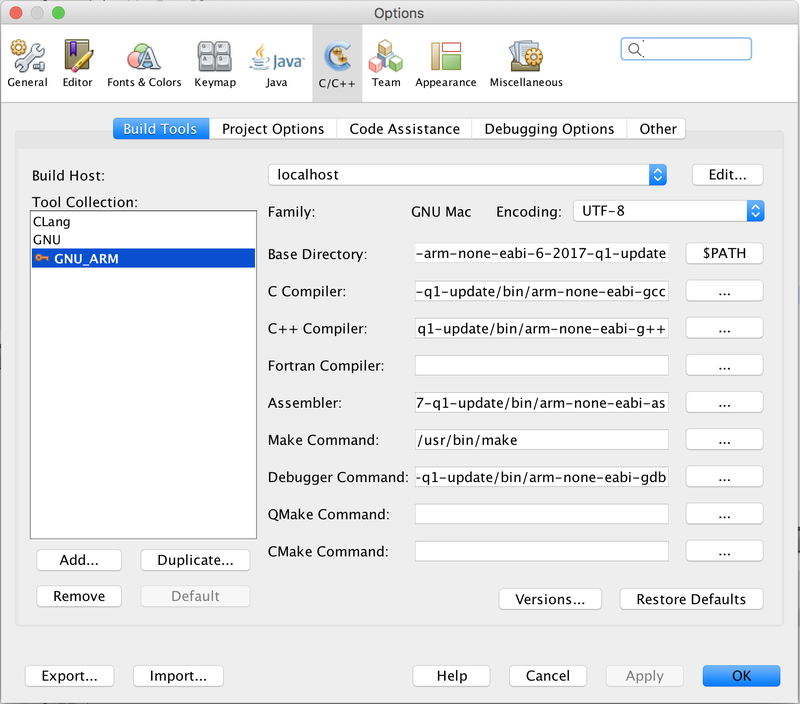 Since it is JVM-based it can run on all the major platforms including macOS, Linux, and Windows. 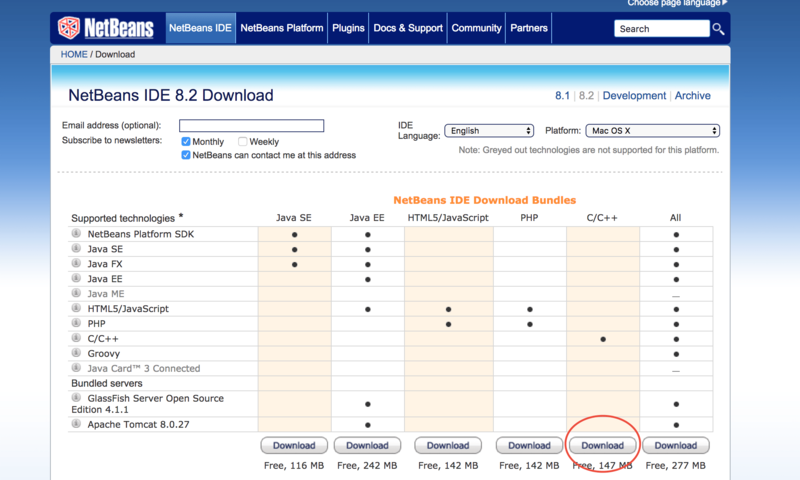 You can download the latest version of NetBeans here. Make sure you download the C/C++ (or “All” version which includes all supported technologies). I am running with version 8.2 (latest as of May 2017). After the download is complete go ahead and install the application. 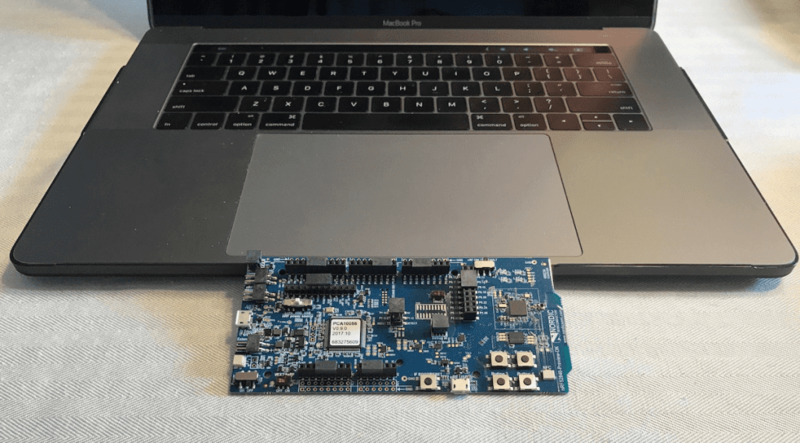 There are a couple of tools that you’ll need to download from Nordic Semi’s site to get started with the nRF52840 development kit. All can be found under the Downloads section HERE. Download each of these to your local machine (preferably you local Downloads folder). nRF5x SDK: nRF5-SDK-zip. (I’m running with version 13.0.0). Download the latest version from this link. I’m running with version 6-2017-q1-update. Look for the Mac OS X 64-bit link. Download the tool here. 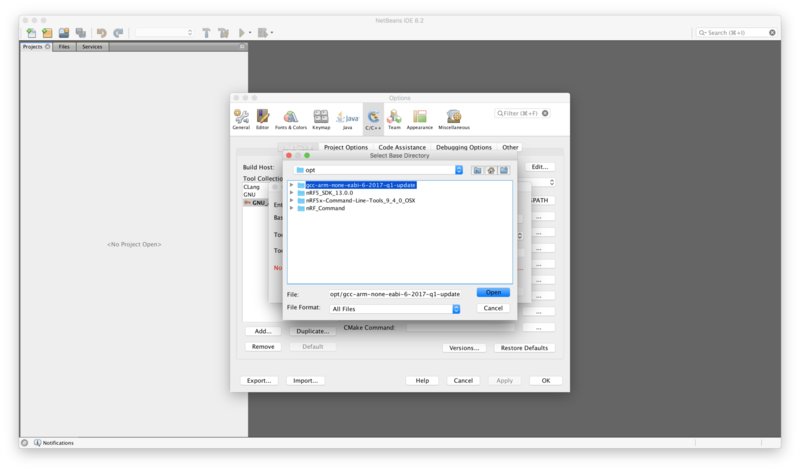 Look for the J-Link Software and Documentation pack for MacOSX download link under J-Link Software and Documentation Pack. After downloading go ahead and install the software. To make things easy we’ll put all the tools in one folder. Start by running a terminal session (⌘ + Space bar -> type “terminal” -> return). [/simterm]After that you’ll want to configure the SDK to point to the correct compiler that you installed. Note: If you are using nRF SDK 14.0.0 or above, you will need to include “/bin/” appended to the end of the path. 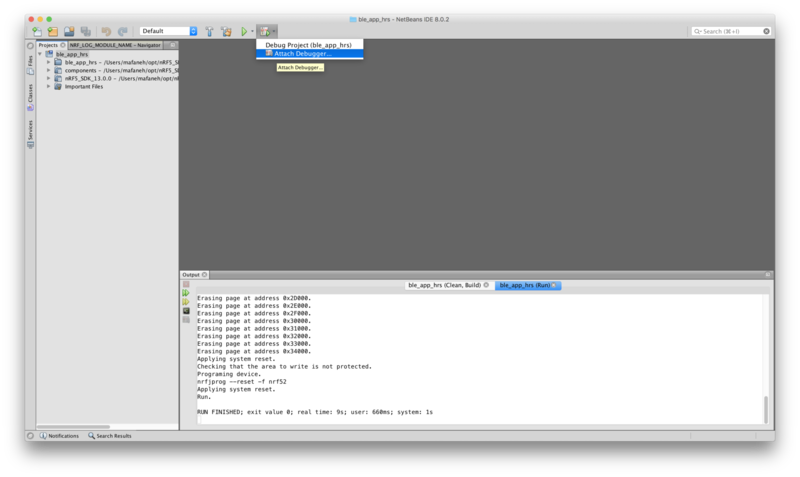 You can use any serial terminal program that runs on macOS. I prefer a multi-platform program called CoolTerm (download it here). We’ll be running an example included in the nRF SDK called ble_app_hrs (Heart Rate Service demo). The project should start building automatically and (fingers-crossed) the build will succeed. This build is fine if we want to just flash the target and let it run. However, if we want to debug the application we need to make some modifications to Makefile. In the Projects window look for the label Important Files, expand it and double click on Makefile. This will remove the code optimization performed by the compiler and also ensure all debug symbols needed by gdb are produced. After this step, you’ll want to clean and rebuild your project. This will make sure that functions and API calls are parsed correctly, and that you can navigate to function and symbol definitions and be able to browse the source code more efficiently (the whole point of using an IDE!). Make sure the development kit is connected to your computer and the LED (labeled LED5) right next to the MCU labeled PCA10056 is lit-up. Hit the Play button at the Top of the Editor window and make sure the operation runs successfully. Now on the actual debugging! Here we’ll learn how to debug a target program in real-time and step through the code. First set a breakpoint in the main() function in main.c (in our example it is located under ble_app_hrs/main.c and the last part of that file. The way you set a breakpoint is click in the margin on the line number of the desired line. Now make sure your JLinkGDBServer is running in the terminal and come back to NetBeans. Note: Reader Mike Wirth pointed out that there are some issues with running JLinkGDBServer in a separate Terminal window. The solution is to run the command from within NetBeans. You can do so by navigating to the menu Window -> IDE Tools -> Terminal and running the command from there (within NetBeans). Click the Dropdown menu arrow on the debug button then select “Attach Debugger”. Basically, JLink connects to the Interface chip (the chip on the dev kit that creates a mounted drive. It then creates a proxy gdbserver on the local machine that allows a gdb process to connect to and debug the target MCU (in this case the nRF 52840). Once you hit OK, you should see NetBeans connect to the gdbserver and momentarily it’ll stop at the breakpoint you set in the main function. It may take a few seconds before it hits the breakpoint, but eventually the breakpoint line will be highlighted in GREEN. We ran JLinkGDBServer in singlerun mode, which means once you hit the Stop Debug button in NetBeans you will have to start the GDBServer again. To run continuously run the command without the “-singlerun” argument. Then when you stop debugging and initiate the remote debugging again JLink will restart the target. Note: there are some well-known difficulties and challenges with debugging applications running with the SoftDevice stack. More about it here and here. The interface MCU also provides a serial output that you can monitor through a terminal program on your development machine. 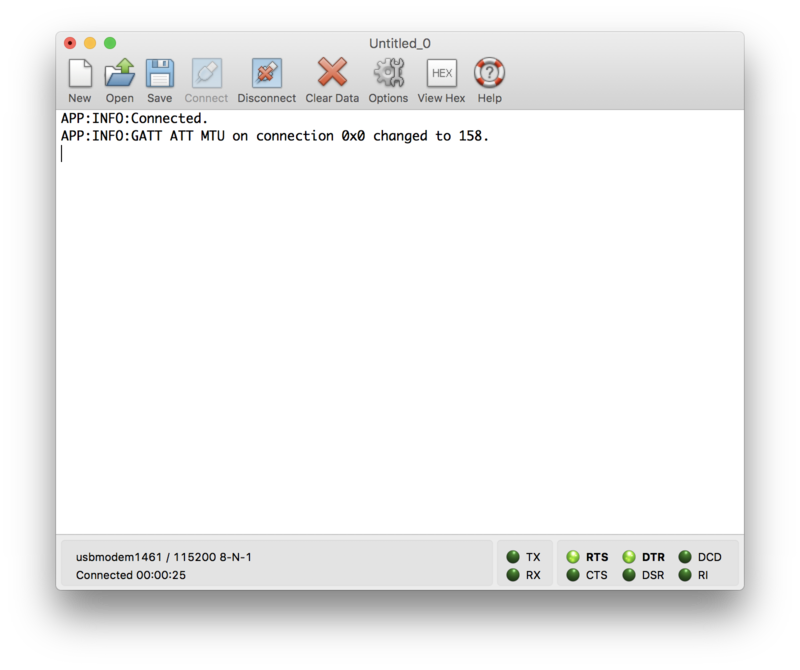 You may have to do a trial and error, for me the serial shows up as “usbmodem1461”. Set the Baud rate at 115200, hit OK then click Connect. Other tutorials for setup and development on other popular BLE dev kits. Feel free to add any comments or questions in the comments section below. Hope you found this post useful! First many thanks for this amazing tutorial! I’m having one problem. At “Configure the Run command (to flash the target)” step I don’t get what you show, but the Run is finished right after press the button. I did all the previous steps and everything works. Can you help me understand what is wrong? Thanks João! Glad you found it helpful. Let me know if those suggestions still don’t fix the problem. Hi Mohammad! Thanks a lot for the quick answer! Yes. I checked both things (first one I even tried to set the path “by hand”) and they are as you say. I still have the error. How you have all the properties at the Run directory? Ok. So my configuration is the same than yours. On the second part it doesn’t work as well. It gives me the same kind of error. Looks like some file is missing or with some different name. João, I sent you an email. It’ll be easier to communicate and try to resolve the problem that way. Thanks for the insight Andreas! João, you may want to check your PATH just one more time to make sure there are no typos. I have exactly the same problem now. Is there any solution for this you discussed via mail? We never got to the bottom of the issue. I think João worked around it by running the command from a terminal instead of within NetBeans. I haven’t run into this issue before. Did you check the Run Command Path (see Andreas’s comment above)? Thanks for such a great tutorial – it was so easy to follow and it worked very well. I also had the problem with nrfjprog not being found and I think it has to do with fast/slow path addressed in this stackoverflow link (https://stackoverflow.com/questions/21708839/problems-setting-path-in-makefile). 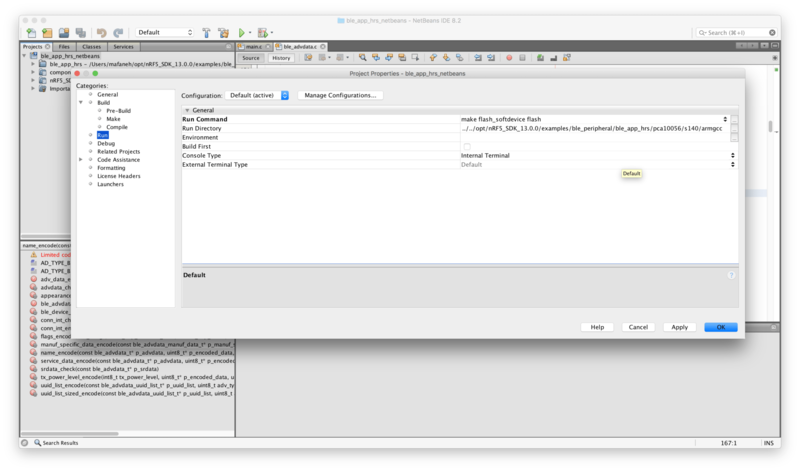 I am using macOS 10.13.1, NetBeans 8.2, nRF5_SDK_14.2.0_17b948a, nRF5x-Command-Line-Tools_9_7_1_OSX, s132, pca10040. By the way… you should mention that Xcode is required to be installed on the Mac. I’ll edit the post and add that as a requirement. Great! It is amazing tutorial! Can I translate this blog into Chinese? Awesome tutorial – many thanks Mohammad! Thanks Ambrose! Glad you found it useful. #error "Not enough resources on board"
is greyed out with and a yellow bulb on the left of the line says "Preprocessor stopped at this #error directive"
Any idea what might be going on? Would greatly appreciate your inputs. Ray, thanks! Glad it helped you out. Yes, this is merely an error in parsing the file and is not affecting compilation. The reason behind this error is the IDE does not recognize some of the macros defined by the project. In this case, there’s a macro that defines the board type called: BOARD_PCA10056. The way to fix it is to add this to the project by right-clicking on the Project -> Properties -> Code Assistance -> C Compiler and then add BOARD_PCA10056 to the “Preprocessor Definitions” field. After that, right click on the Project again and select Code Assitance -> Reparse Project. This should fix the issue and the BUTTONS_NUMBER should now show up in Blue and the yellow bubble should disappear. Another (easier) way is to edit the configurations.xml file located under the NetBeans project folder and add all the preprocessors in the preprocessorList section. I thought others may benefit from this tutorial especially if they’re looking for other options for development on a Mac using open source tools. Hello, I had another question if you can provide some guidance. I am having some trouble with some of the debug steps when active connections are involved as i am facing time-out issues, I was wondering if it is a possibility to put display statements through the Netbeans IDE ( like printf in C/C++). So that i can get variable values or follow execution path without needing to pausing the execution. 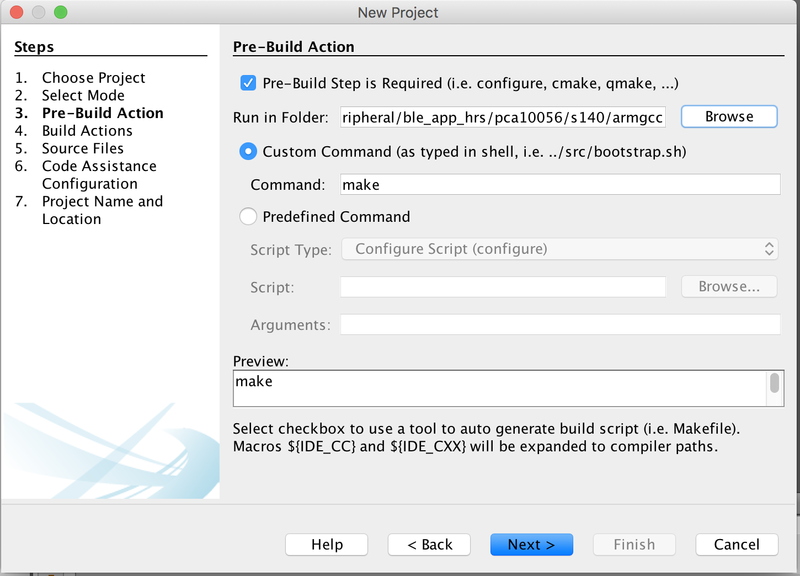 Yes, there’s a way to do that within NetBeans (if you’re running on a Mac or Linux). After that, you’ll be seeing the serial output from within NetBeans rather than in another separate terminal program. To make sure you’re connecting to the right serial port, you can look at the devices with a name similar to /dev/cu.*. Do you have any idea regarding to this issue? I greatly appreciate your inputs. Mike, glad you found the tutorial useful. The only thing I can think of is that the USB port on which the development board is connected is not mounted to the VM. I’ve seen problems with mounting the dev board to a VM, but it may work for you. Let me know if it works. Thanks for your quick reply! Once the SEGGER J-link is selected in VM, I am able to flash the example to the development board. However, I still have some problem for debugging. When I insert the breakpoint and start the JLnkGDBServer, the breakpoint line is always red and never become green. Any ideas and suggestions? I really appreciate your great help! Hi Mike, can you post the output of JLinkGDBServer? The output should show whether the breakpoint was recognized by the GDB Server or not – it would print out a confirmation of any breakpoints you set. Great Tutorial ,Thanks Mohammad Afaneh. I followed your tutorial for my nRF52DK on UBUNTU 16.04 Everything is working well but while debugging i set breakpoint which never become Green . Looks like the breakpoint gets set correctly (Setting breakpoint @ address 0x00020EFE, Size = 4, BPHandle = 0x0001), and then it hits it as well (…Breakpoint reached @ address 0x00020EFE). However, for some reason it is resetting the target right after this. Not sure what’s going on there, but I will try with a Linux installation on my side when I get a chance. Thanks For quick reply .I will also try to find reason why the target is getting reseted repeated. I’m having trouble at the very beginning stages of the process. When I go to compile all the tools into one folder, i am getting an error message. I’m not sure what is wrong but if you could help that would be awesome. Thanks again for this great tutorial, it’s sweet! – Make sure that the file exists and matches the name you’re passing to ‘tar’. – Check the permissions on the file (use ‘ls -l’ to display them and make sure the file is at least readable). One thing I noticed is that you have “downloads” all lower case. Usually on macOS, it will be “Downloads” instead, and since names are case sensitive you’ll need to make sure they match. Thank-you very much that worked perfectly. according to the actual configuration of your system. ../../../../../../components/toolchain/gcc/Makefile.common:25: *** Cannot continue. Stop. Do you have any idea, how i can perhaps fix this ? Thanks again in advance as always Mohammad. You’ll need to update the Makefile.posix file to point to the correct version of the gcc toolchain. There’s a step at the beginning of the tutorial under “Setting up the downloaded tools” that describes where to find the file and how to update it. Did you follow that step? Actually I tried the other tar commands too, they just don’t seem to be working. The first time though they all worked fine except line 3 but this is the new error messages for the remaining two when I run the command. Jonah, are you still having trouble with the commands? For .zip files, you can just extract them by double clicking in macOS. For .tar files, these are already uncompressed files, so you can remove the “-c” option (I believe). I did, everything worked fine except line 3 of that. I received the following error message, I’m not sure what went wrong. Should I delete and re-download gcc ? There were a few things i needed to change to get it all working correctly, so i’m passing this on in the hope it might help others. mdb983, thanks for sharing this useful info! I’m using the same OS and machine (13″) and the latest version of NetBeans C++ 8.2 with updates. The other difference is that I have a PCA10040 .. but beside the very first build I cannot move forward. Thank you for this great tutorial.. I am gettine an error..
../../../../../../components/toolchain/gcc/Makefile.common:129: *** Cannot continue. Stop. i have tried flash softdevice thing also but in there it didn’t work.. i have put the currect location at makefile.posix but that “-gcc” thing comes from somewhere which not in arm gcc..
What version of the SDK are you using? 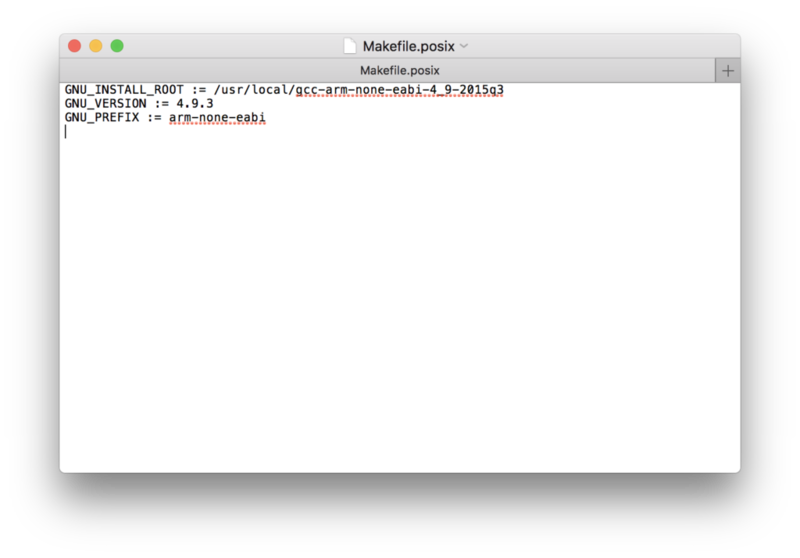 I just found out that v 14.0.0 and later has changed how the Makefile.posix file behaves. Now it expects the path to gcc but requires adding “/bin” to the path. So if you’re trying this with SDK v 14.0.0 or later, can you try this and report whether this fixes the issue? or whatever the correct path is on your system. I am stuck with this ad no sure where to look for and would appreciate any help. I use NetBeans 8.2, pca10028 board (nrf51822 chip). Let me know if this fixes it. It may not be the only problem. Thanks for quick reply but it did not help. Gives me the same error. Did you set the Build Result file? The instructions are listed under the section “Setting the Build Result file” in my post. Degugger Error: \”/usr/bin/make\”: not in executable format: File format not recognised. Or it never meant to work that way? Ok, glad that resolved the issue. Yes, starting/running the debugging session from the IDE (using F5) is meant when debugging local applications, not remote GDB debugging. HI, Thank you very much for a detailed article. It gave a a good start to move from Windows to Mac. 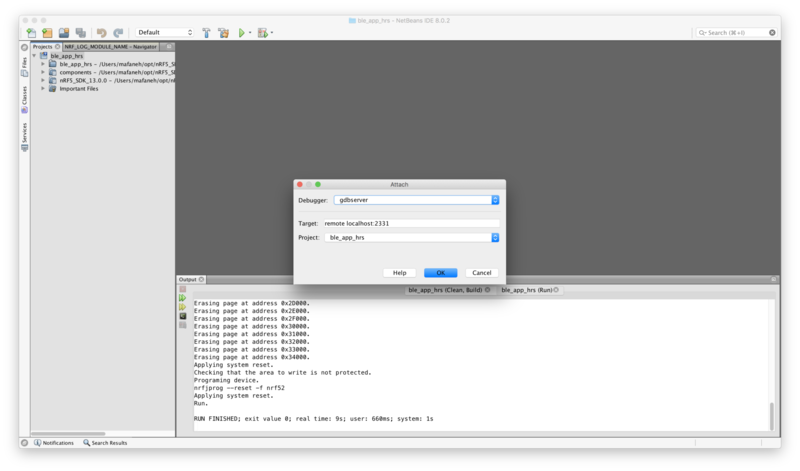 I was also hoping if you can help me with setting nRFGoStudio on mac, I tried with Wine using PlayOnMac, but could not do so, as PlayOnMac did not support JLink_Windows_V620h nor the nRF5x-Command-Line-Tools_9_7_1_Installer. I have problem with compile ble_peripheral/ble_app_uart. Size of my hex file is only 106,7kB while size of pre-compiled hex file “ble_app_uart_pca10056_s140.hex” in hex folder is 447,6kB. My binary doesn’t work. Should I link some other libs? How to do this? I know how to fix it. In project properties at Run Command textbox should be “make flash_softdevice” (without quotes). Size of hex file is no matter – it’s just linker optimizes. Glad you found out how to fix it. Was there anything wrong/misleading in the post that led to this? Makefile.posix needs to be updated in the below fashion. I think you need to give the path until -> bin. This worked for me. Sai, yes. That’s actually a change that was introduced with nRF SDK version 14.0.0 (and above) – I will update the post to point that out though. 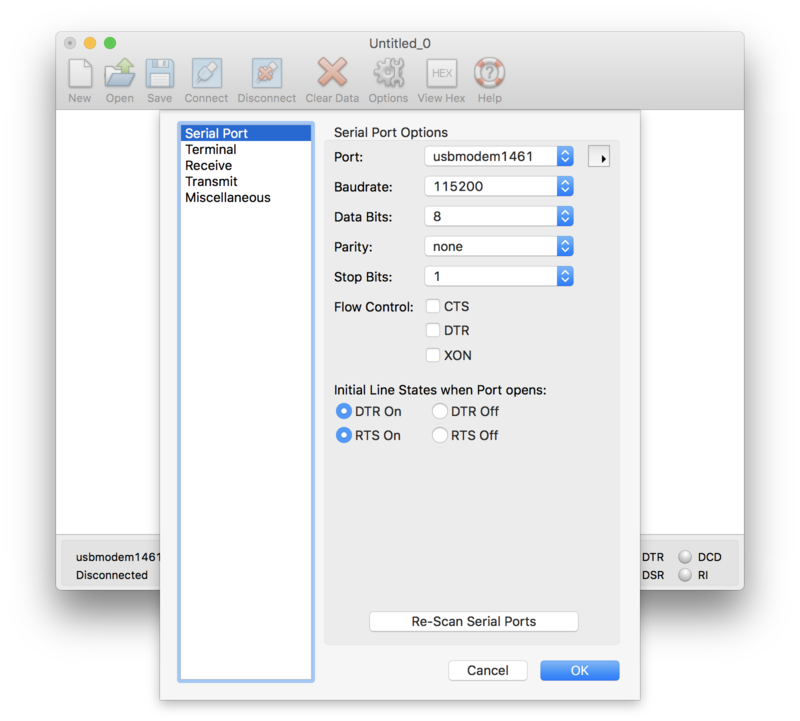 How do you set the run path for NetBeans? In the terminal, I added nrfjprog to the PATH variable but when I “run” the program on NetBeans I get the following error: “make: nrfjprog: No such file or directory”. Using the nrfjprog from the terminal I was able to successfully flash the softdevice on my nrf52 board. However, I still do not understand the reason for the error I got when I used the “run” command on the NetBeans IDE. 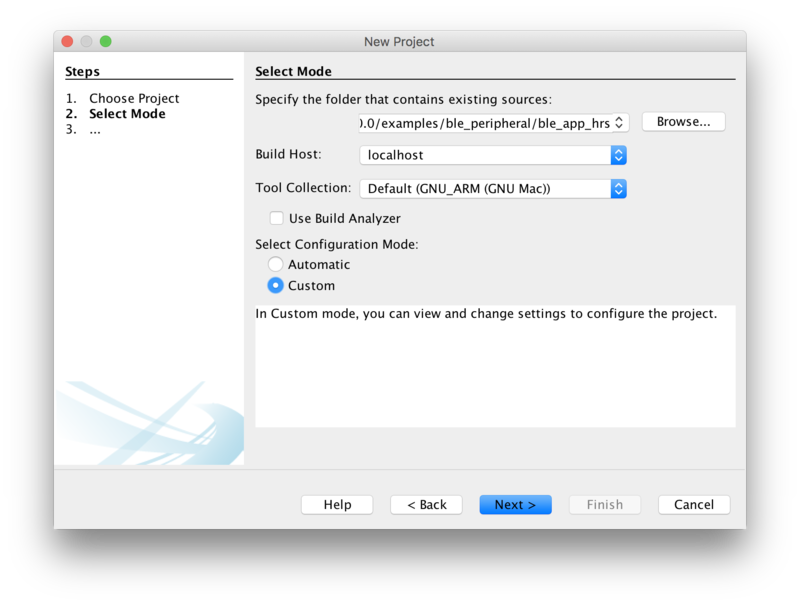 The run path in NetBeans is set under the menu: NetBeans -> Preferences -> C/C++ -> $PATH (next to the field labeled “Base Directory”) -> Modify Run Command Path. I have the path to nrfjprog set there. I can send you screen shots if you’d like. Another thing I am seeing is a case p_ble_evt not being recognized by the compiler… Line 780 case BLE_GAP_… “unable to resolve” any idea why the code assistant / compiler isn’t understanding this case, I’m guessing these are enumerated in a header filer somewhere…. Thanks, John-Paul! I’m glad you’ve found it useful. 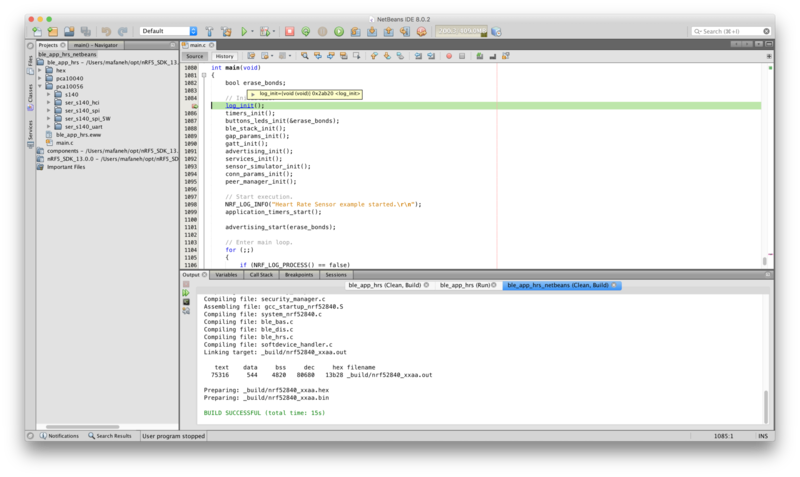 On another note, I recommend you check out Segger Embedded Studio (SES) instead of NetBeans. I’ve been using NetBeans for a while but looked into SES recently after Nordic and Segger announced their partnership, and have decided to make the switch. I’ll be writing a tutorial in the near future on how to use SES for creating and developing a new project. Hello, thanks a lot for the wonderful tutorial! I followed it for Ubuntu 16.04 and everything worked perfectl! need to include “/bin” to the path. Actually, it is “/bin/” (an additional slash is required). I am facing a weird problem now that I started using the Debug function. Actually, everything seems to be working fine: I can start the JLinkGDBServer (I tried both from an external terminal and from the terminal inside Netbeans), I can attach the debugger, but then….nothing happens. By this I mean that I see printed on the JLinkGDBServer the text “Starting target CPU…”, and this stays there forever (I waited for 15 minutes, but nothing happened). A new file opens automatically in Netbeans, named “Disassembly”, which is empty, and the normal Debug buttons (run, stop, pause, step over etc.) are shaded, so I cannot click on them. I double checked that I correctly set the make –> build result path as you described in the post, and I double checked that I included in the Makefile the -ggdb flag. To be sure, I tried different projects, including original projects from Nordic examples I did not modify, I tried different USB ports on my PC and I tried applications both with soft device and without….still no luck. Just for you to know, I am working under Linux Ubuntu 16.04, but until now I did not find any difference at all between your guide and my system…..Thanks a lot! Have you considered moving to Segger Embedded Studio instead? 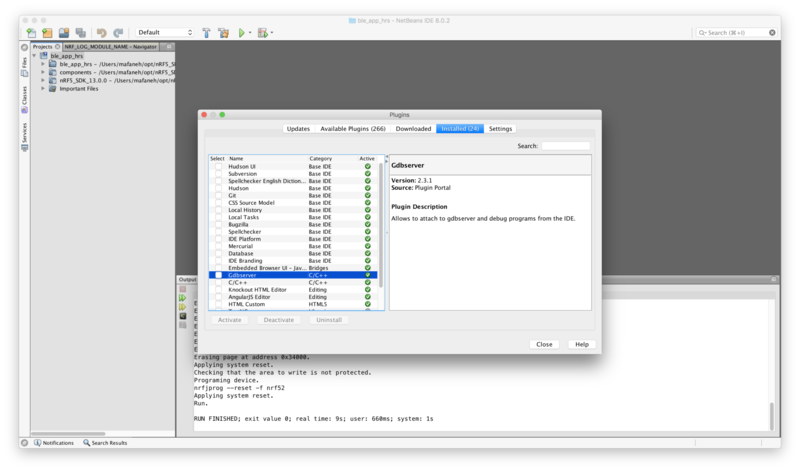 Unfortunately, I have moved away from NetBeans (at least for nRF development) and have recently switched to using Segger Embedded Studio (SES). SES is a professional IDE with built-in support for J-Link and target debugging, and best of all Segger provides a free license for nRF developers! It’s also cross-platform so it works on Linux, macOS, and Windows with minimal setup involved. I’m currently working on a blog post detailing how to set it up and use it for nRF development. thank you! I didn’t consider it yet until now because of the cost of the license and because I liked having all my code on one IDE (I do not program only nRF chips). I will have a look while waiting for your blog post then. Thank you. I thought it may be useful for you to see the JLink output…here it is! Really great tutorial! Thank’s a lot! You’ve got a gift for explanation! It’s rare to find any tutorial with so much explanation in so few words. It’s very clear and concise, and very much appreciated! Thanks, Roger! Glad you’ve found the tutorial helpful! A very detailed and admirably well written tutorial. I have encountered one issue. I’m running NetBeans 8.2. I have successfully been able to compile and flash the device. The gdbserver is running, reporting that it is connected. But: When I click on “Attach Debugger”, no pop-up window is displayed to permit configuration. It’s a bit difficult to debug NetBeans issues sometimes. Are you still running into this issue? Are you using it to program and debug nRF52 applications? What happens when you click on “Attach Debugger”? Anything at all? Ok, great! I was gonna say, if you’re using it for nRF5x development, then you’re much better off using SES (as I’ve switched to using myself as well). Glad that’s working well for you! I am using nRF51 on a windows machine. Everything till the debugging works great. I have been trying to get the debugging to work and is not having the greatest luck. I have the J-Link GDB server running and I am using SWD 2 wire with a J-Link Base. Every time I try to attach the debugger I don’t see anything happening other than a window with “: No such file or directory.” I also noticed that I need to run the GDB server from NetBeans so I did that as well and I also selected a GDBInit file that I found inside the SEGGER folder. Thank you and thanks again for this great tutorial.